Top Ten Holiday Gifts for Whooshers 2015! Below are some ideas, products, gestures and links to complete every Whoosher's holiday wish list. They're soft and they help raise pulsatile tinnitus awareness year-round. 9. SleepPhones! The soft fleece headphones that lay flat on your ears to help mask the whooshing sound and help you sleep. 8. DONATE to Support Pulsatile Tinnitus Research! Usually, you may do so in honor of someone. The funds help our entire pulsatile tinnitus community. Be sure to indicate PULSATILE TINNITUS when you submit your donation for 100% of funds to be allocated to pulsatile tinnitus research. 7. A Good Pair of Ear Plugs! Sometimes when an earplug is placed in the ear the sound of the whoosh subsides. This is especially helpful when trying to get to sleep or while reading. Ear muffs may work, too! 5. Sign the Petition for a Pulsatile Tinnitus Diagnosis Code! And ask everyone you know to do the same! Another great option is a white noise audio file that can be played on an iPod, iPhone, or MP3 player. Many of these are free online. 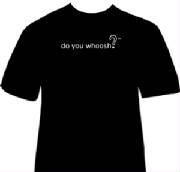 Help your Whoosher download and play the audio file. All funds go toward finding and posting info for the pulsatile tinnitus community. The best thing a Whoosher can receive is comfort that those around us try to understand this unusual symptom we deal with and how it affects us. Listen and learn more about pulsatile tinnitus on Whooshers.com. Understand that pulsatile tinnitus is NOT regular tinnitus. It is a rare symptom. Participate with us on Whoosher Wednesdays through the year and help our community get more attention and support!